Roguelikes, as a genre, are fairly uncompromising. They’re incredibly focused on emergent gameplay and have led the industry on those terms (inspiring much-loved crossover titles like Diablo, Spelunky and The Binding of Isaac), but that focus has come at a cost. Few have representative artwork of any kind, favouring the convenience of ASCII, and many implement their richness of interactivity via scores of arcane keyboard shortcuts. 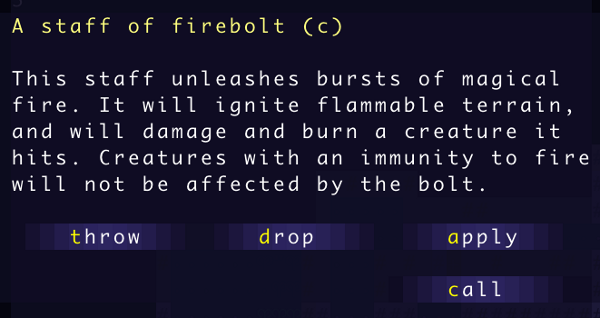 Dwarf Fortress – which, though not a roguelike as such, shares their values – famously takes hours to learn to play and, to the uninitiated, looks a bit like your PC just crashed. Even so, the games on the other side of all that are unparalleled in systemic complexity and worth learning from if you tread near their territory. To that end I’ve been looking at modern roguelikes recently, reacquainting myself with the genre, and I figured I’d start with some of the smaller ones. I got as far as Brogue and I’ve just been playing that since. 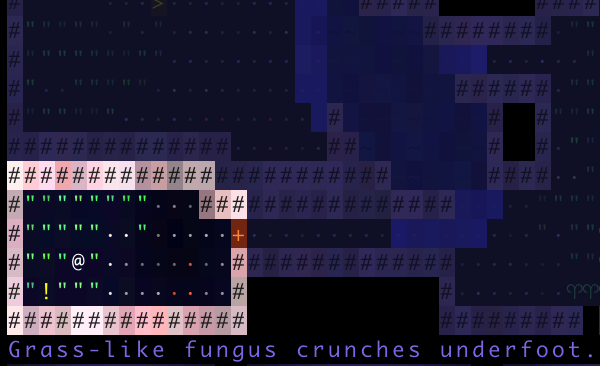 It’s an ASCII roguelike, sure, but it’s pretty easy to interpret what’s going on. It uses colour well. Heck, it’s kind of pretty. It even tells you what its key commands are. Basically, it’s witchcraft – it’s an attractive, comprehensible ASCII roguelike which doesn’t even need a help screen, let alone a manual or pages of “spoilers”. Admittedly, it lives on the simple/streamlined end of the roguelike axis. There are no race or class options in Brogue. There are no sidequests. It’s only got three character stats. But the traditional dungeon-crawling, inventory-identifying core of the roguelike is present and correct. Beyond that core there are chasms to skirt, lakes to cross, wildfires to escape, locked rooms full of treasure to penetrate and creatures that slick you with acid or explode into clouds of poisonous gas in the way. There’s plenty here to keep things fresh for quite a while. Need I go into the time I found a magical artefact and summoned a certain mythical creature through a portal to help me out? Or the time I nearly reached the bottom of the dungeon, only to miscast an obstruction spell and be frozen in crystal while a battlemage hit me with fireballs? I’ve played this for hours and I suspect there are still entire game mechanics and plenty of special interactions between systems I haven’t seen yet, not least of which is the actual end of the game! If you ever thought delving into dungeons with nothing but your wits to protect you from unforeseen dangers in ever-changing, constantly surprising situations where the smallest mistake might end your run forever sounded like fun but were put off roguelikes by the learning curve, Brogue is the way to go. The @ symbol? That’s you. The rest, hell, just click on stuff. You’ll figure it out. Brogue is free to download for Windows, Mac and Linux.